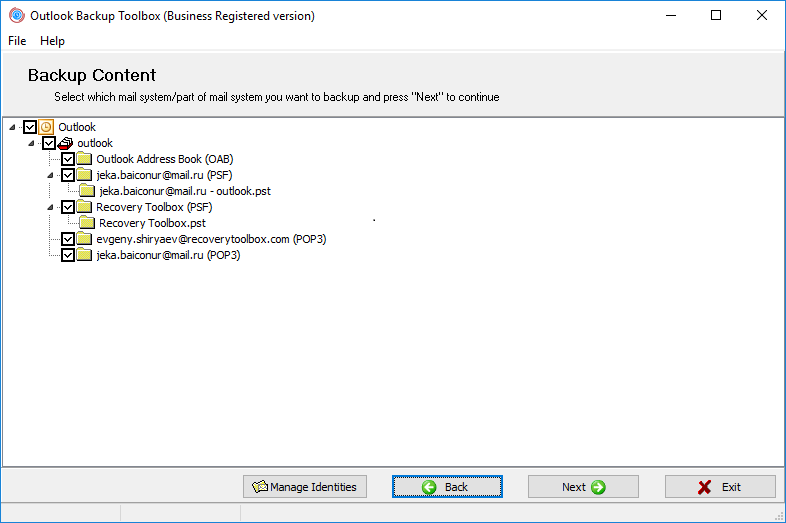 Outlook Backup Toolbox (Download) was created with simplicity in mind, which makes it naturally easy to use. You won't need any special skills or knowledge to successfully back up your data and restore it at any time. Just follow the simple instructions below to be always sure that your valuable Microsoft Outlook data is reliably protected from any threats and that you can always roll the system back to its previous state no matter what happens. 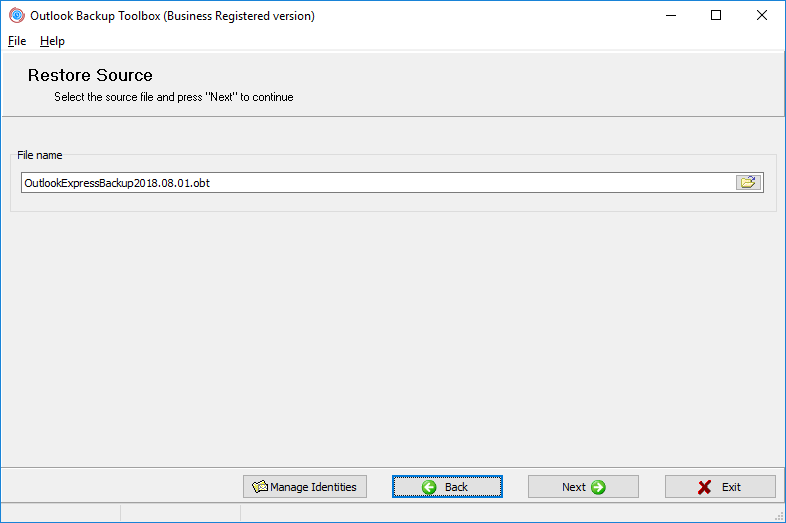 The interface of Outlook Backup Toolbox is essentially a wizard that guides you through several simple steps and allows you to configure certain aspects of the backup and restoration processes. You can go forward to the next step or backward to change settings at any time, so don't hesitate to do so whenever you feel necessary. 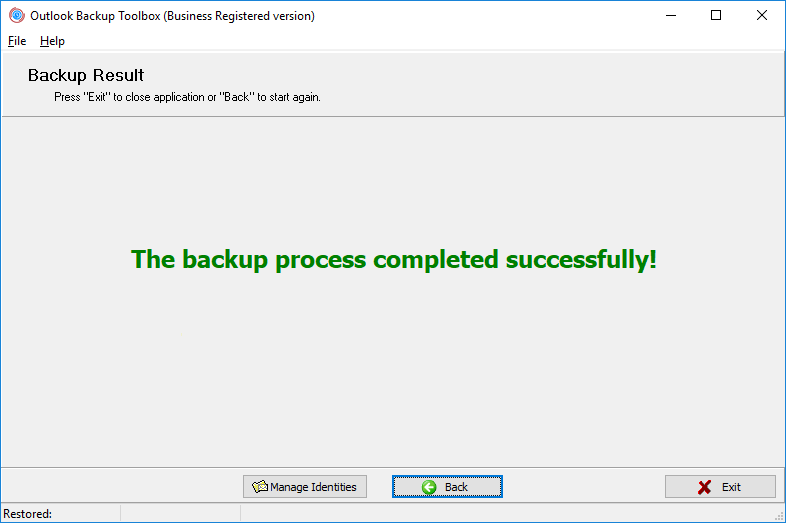 The startup screen of Outlook Backup Toolbox contains only three functional buttons: Backup, Restore and Manage Profiles. The names of these functions are fairly self-explanatory, but we will describe the features behind each of them in great detail. Pressing the Backup button will bring up the first screen of the backup wizard. This screen contains a tree-like structure of your Outlook profiles with data files (*.pst) and account settings (POP3, IMAP, HTTP, etc). The program enables you to back up and restore data and account settings independently, which comes in handy for partial backups. You can check and uncheck the items you want to include in the backup file. If you want to include all of the available Outlook data and settings, leave all the boxes checked and press Next to proceed to the next step. That's where you define the name and location of the output backup file. To do that, either type the path and file name in the input field or use the standard Save File system dialog. Once done, press Next to proceed to the next step. This option defines whether the backup procedure will be run once or added to the list of scheduled system tasks. If the latter option is selected, pressing the Next button will bring up the standard New Task dialog. Most of its fields will be already pre-filled, so all you will have to do is set the recurrence pattern for the new task - daily, weekly, monthly, at Windows startup, when a user logs in - and specify the day of the week and time the task will be launched at. The final part of the task creation process requires you to enter the username and password for the user on whose behalf the task will be started. Once this stage is complete, the task will appear in the standard Windows Scheduled Tasks window (Start | All Programs | Accessories | System Tools | Scheduled Tasks) and you will always be able to modify it in the future. This option enables you to set the backup file compression level. The lower it is, the faster your computer will back up your Outlook data and save it to the output file. Low compression is recommended for extra-large backups performed on relatively slow PC's or in time-critical situations. In all other cases, higher compression levels will result in a reduced size of the resulting backup file and will save your disk space. This handy option enables you to select the size of the volumes your output file will be split into. This parameter depends on the type of medium that the backup file will be stored on. The dropdown field of this option contains several predefined values - from 1.44 MB floppy disks to 700 MB CD's. If necessary, you can type the exact volume size in bytes. 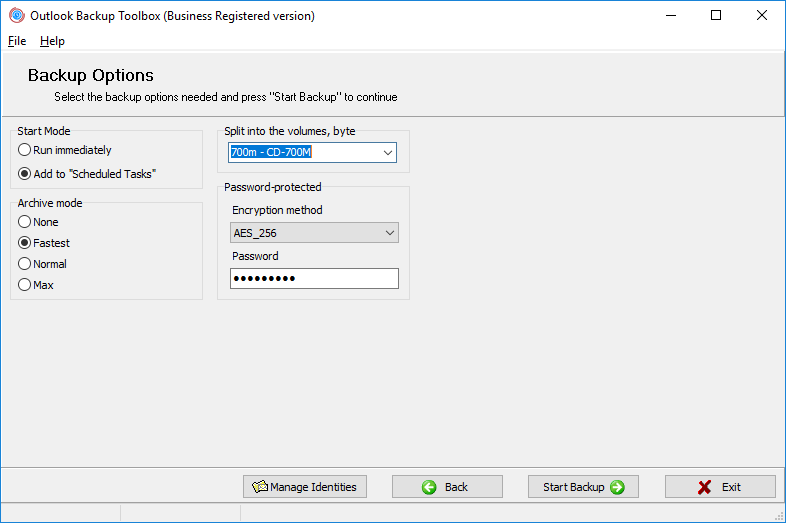 Outlook Backup Toolbox allows you to password-protect your backup files and select the encryption algorithm to be used: PkZip classic, AES128 or AES256. If password protection is not necessary, just leave the option set to No Encryption. This is the final step of the backup preparation process. If you selected the Run Immediately option, the program will start backing up your Outlook Data once you press the Next button and confirm your intention to proceed. However, if you decided to make the Outlook backup process a regular procedure that should be added to the list of scheduled tasks, the Next button will open the New Task dialog described above. After you finish configuring the tasks parameters and press OK, the program will show a confirmation text if the task has been added successfully. The duration of this process depends mainly on the amount of data stored in your Outlook data files, the speed of your computer and the output file compression level you set on the settings page. Once the backup process is finished, you can go back using the Back button to change settings or choose another output file. Your Outlook data can be restored at any time and using any of your backup files. To do that, go to the main screen of the program by restarting Outlook Backup Toolbox or pressing Back until the main screen is reached. On the main screen, click the Restore button. 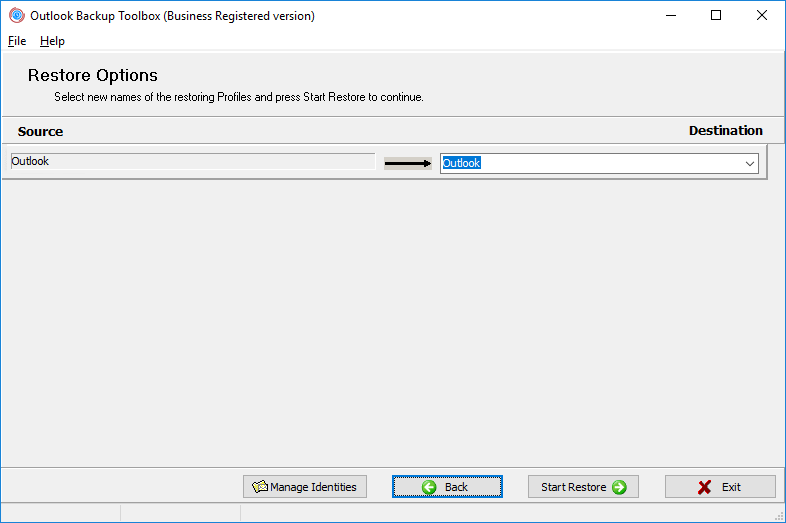 In the Simple Restore mode, if the name of the existing Outlook profile matches the name of any of the profiles being restored. 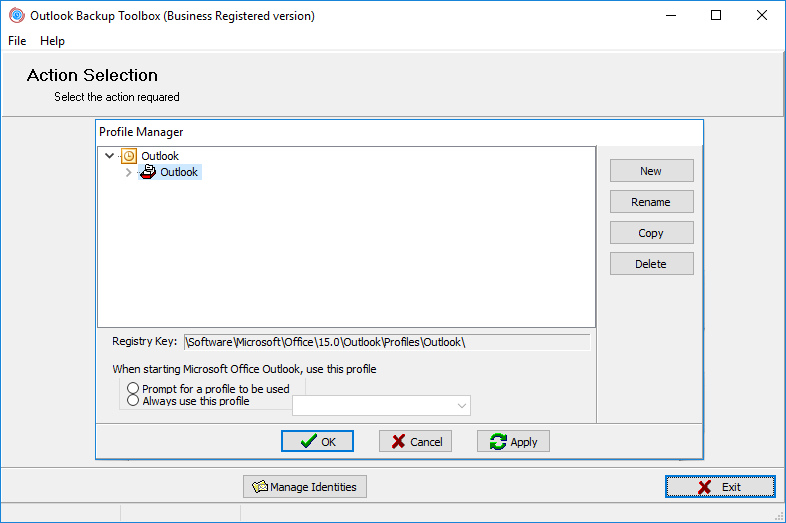 In the Advanced Restore mode, if the name of the existing Outlook profile matches any of the names specified at Step 3, no matter how it was entered - typed by the user, selected from the dropdown list or suggested by the program. PLEASE BE EXTREMELY ATTENTIVE WHEN RESTORING YOUR DATA AND DOUBLE-CHECK THE NAMES OF PROFILES YOU WORK WITH. THE CREATORS OF THE PROGRAM BEAR NO RESPONSIBILITY FOR THE LOSS OF DATA CAUSED BY YOUR NEGLIGENCE OR IGNORANCE OF THE USAGE INSTRUCTIONS. Two data restoration modes are available in the program: Simple Restore and Advanced Restore. The Simple Restore mode is the simplest and the most straightforward way of restoring Outlook data. It is primarily intended for users who have a single Outlook profile that is occasionally backed up and restored (for more complex Outlook configurations, we always recommend using the Advanced Restore mode). Just select the backup file to be used by typing the path and file name into the File Name field or use the standard Save File dialog to choose the necessary backup file. After that, press Next and answer Yes in the confirmation dialog to start restoring your data. ATTENTION: At the beginning of the restoration process, the software analyzes the data being restored and can prompt you once or twice depending on the structure of the backup file and your current Outlook configuration. If there are 2 or more profiles in your Outlook setup, Outlook Backup Toolbox will ask you to choose the destination profile your data will be restored into. The opposite is also true - if the backup file contains more than 1 profile, the software will prompt you to choose the one to be used for restoring data. Therefore, if both of these conditions are met, the program will show two prompts. 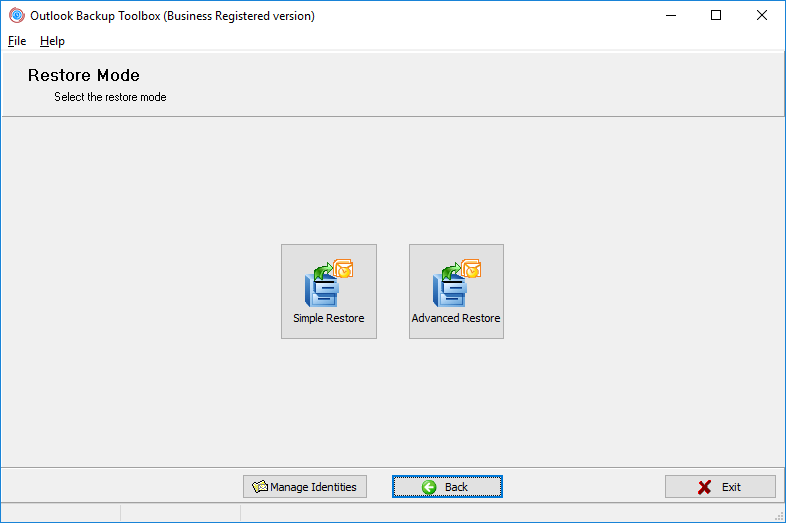 The Advanced Restore mode gives you more flexibility in defining the profiles, account settings and Outlook data files to be restored. The first stage of the process is identical to that in the Simple Restore mode - you select the backup file to be used for restoring your data. This can be done either by typing the full path and name of the necessary backup file in the File Name field or opening the standard Save File dialog by clicking a small icon to the right of the field. Once the backup file is selected, press Next. The second screen of this wizard enables you to select the profiles, account settings and data files to be restored from the file. Just check or uncheck the necessary items and press. If you want to restore all of your Outlook data, leave every box checked and move on to the next screen by pressing the Next button. The next and the final step of the data restoration process allows you to select the destination profile your data will be restored into. Two options are available here. If you want to restore a profile under a different name, type it in the field opposite the profile you are restoring. If you want to replace a currently existing profile by the profile being restored, you can select the profile to be replaced from the Destination dropdown list. Once these parameters have been configured, press Next. After you answer Yes to the confirmation prompt, the program will start restoring your data. Just like in the case of the backup process, the speed of data restoration depends primarily on the speed of your computer and the amount of data being unpacked. Besides backing up and restoring Microsoft Outlook data, Outlook Backup Toolbox enables you to manage your Outlook profiles without leaving the program. Click Manage Profiles on any program screen and the profile management window will open. Here you can view the current structure of your Outlook profiles. The profile manager enables you to copy, rename and delete existing profiles, as well as to create new ones. This handy feature will save your time when performing multiple backups, creating profile duplicates and restoring data into additional Outlook profiles.